Hormann sectional garage doors, In our experience, are probably the best automated door on the market in terms of strength, security as well as long term reliability. Sectional garage doors are now essentially one of the fastest growing door types in the U.K. They make up about 70 – 80% of the U.S. and European market. They offer greater security, fantastic sealing, insulated options, no swing out, very large size ranges and excellent smooth opening properties. The most noteworthy advantage of sectional garage doors over up and over doors is that they do not swing out when they open or close. The tracks curve at the top into horizontal tracks to follow the garage roof line. The individual panels have two rollers per panel which gives them a very rigid and positive movement. Sectional garage doors are available in 3 different thicknesses, non-insulated, 42mm of insulation as well a 64mm. These doors are easily automated and can also open higher than most other door types. If you’d like to find out how our garage doors could change your home, contact us today on 01366 382815 , you can also email us at info@fenlandgaragedoors.co.uk. 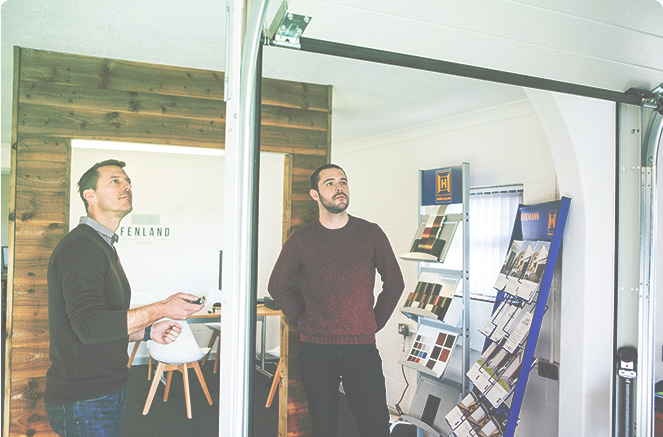 Our friendly staff are always happy walk you around our Showroom in Downham Market, no appointment required. 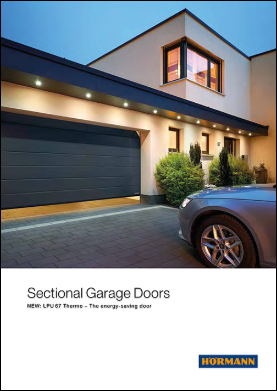 If you would like to download the Hormann Sectional Doors brochure, you can find it below.